Ilizarov bone transport for large bone defect is challenging and may end in distraction osteogenesis failure. Ten forearm and seven tibial defect cases with failed regeneration due to ischaemia during bone transport were studied retrospectively. Mean forearm and tibial defects were 5.5 ± 0.8 and 7.6 ± 1 cm respectively, or 22.3 ± 3.6 and 20 ± 2.3% as compared with healthy segments. Most patients had numerous previous operations (2.6 ± 0.5 and 3.4 ± 0.8 per patient, respectively), extensive scars locally and post-traumatic neuropathy. There were seven infected defects. 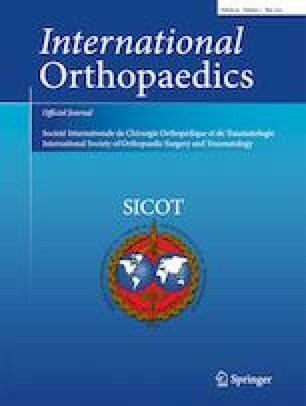 Mechanical solutions used were (1) additional osteotomy and transport of the fragment to compact the ischaemic regenerate (10 forearms, 4 tibias) and (2) compaction of the connective tissue layer in the tibial regenerate with either two 5-mm steps (two cases) or gradually (one case). Bone integrity was restored in all the cases. Complete compensation of the defects was achieved in 12 patients with the first technique. Two patients with 8-cm ulna defects remained with residual discrepancy. In the forearm, mean compaction was 1.7 ± 0.4 cm. It took 25.7 ± 5.4 days followed by an average fixation period of 107.1 ± 11.8 days. In the tibia, mean longitudinal compaction by distraction measured 1.7 ± 0.8 cm. The second technique ended up with an acceptable shortening of 1 cm in two cases. Four centimeters were compressed in the third case gradually. The technical solutions used for mechanical effects on the ischaemic distraction regenerate resulted in its rescue and bone union in all the cases. The authors would like to thank Tatiana Malkova from the medical information service of our institute for her contribution to the literature review and English language interpretation.